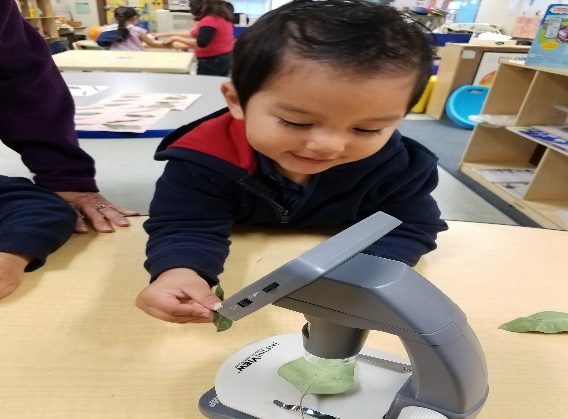 Ten students at Chase Street Elementary School (Los Angeles Unified School District), ages 3-4, all with special needs. What urban forestry concepts did you teach in the classroom?I taught them how to differentiate different tree species. We talked about deciduous versus evergreen, the leaf shapes of a variety of trees, what trees need to survive, the importance of being kind and gentle with trees, what they liked about trees, who lived in the trees at school, and in other places, and how the students felt about the areas of school where there were trees versus the areas without trees. A variety of methods were used. We looked at different types of trees in books and online, and at the photos from the Operation Resilient Tree packet. Then almost daily, we walked around the school and talked about the different types of trees and which (Chinese Pistache) were on the Resilient Tree list. Our school borders a park, and while we are not permitted to go to the park, we can still see and collect leaves and acorns from the many trees that are on the border fence. 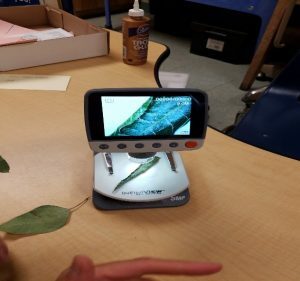 What hands-on activities did you have your students perform to reinforce these concepts?They collected leaves from various trees at school (and we brought in others from home) and observed them under our microscope (purchased with the microgrant funds). 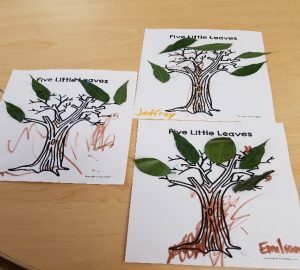 I created a project where 4 types of leaves were stapled on the left side of a paper and they had to sort through a pile of leaves to find the matching ones and attach them on the right. These were the same leaves they had previously observed under the microscope. 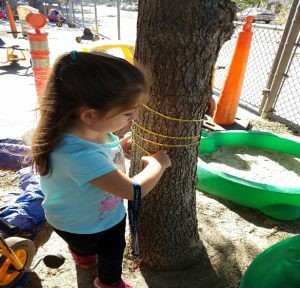 This not only taught about trees but age appropriate concepts of similarities and differences, matching, and fine motor skills. Interested in using this lesson plan? Download it here: Lesson Plan- Trees-Matching LessonLeaves were also used to teach pre-math concepts such as one to one correspondence and counting. In addition, we did our best to measure trees, including Chinese Pistache trees, on our campus using the dual sided diameter tape measure provided by Earthwatch. They wrote down numbers as best as they could, and compared how many times the tape measure went around a tree that was big versus small. Unfortunately, Winter Break started in mid-December and it has been raining almost non-stop since school began again on January 9th, so we were not able to complete much data collection at this time. 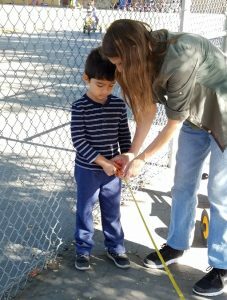 I still plan to invite parents and students to come measure and collect data together, but it will have to be during the next group of trees (phase 3.0). 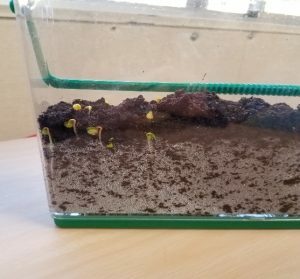 Another project involving a microgrant item was planting radishes, onions, and carrots in our root view container. First the students added water to the soil pellets and mixed and chopped until the pellets became usable soil. Then they spooned their soil into the planter, put in a few seeds, spooned in some more soil, and then we watered it. It began to grow very quickly. They are able to observe not just the above-ground growth but the roots as well. Since they all enjoy watering it, I decided to have them water it using eye droppers. They use the droppers to absorb water from a bowl, and then carefully move the dropper and squeeze it so that the water comes out onto the plant. 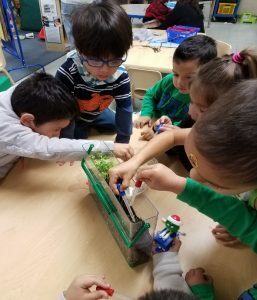 This teaches fine motor skills as well as hand-eye coordination, especially since the root view planter is narrow. How did you use and/or modify Earthwatch’s Resilient Trees protocol in your hands-on activity to measure trees?Without parent participation, the only thing we have been able to do as far as data collection is measure trunk diameter, and talk about which tree is bigger and how that corresponds to a bigger number. They are in preschool, so the idea that 10 is a bigger number than 5, and represents more, is something they are still learning. We did a lot with tree/leaf identification, and deciduous versus evergreen, and talked a lot about Chinese Pistache trees as there are many on our school campus. What were the best positive outcomes for your students as a result of these urban forestry lesson plans?There seems to be an increased excitement/interest level about trees and plants. 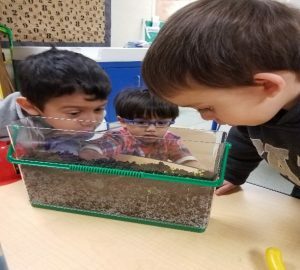 Every morning they want to see how the plants in the root view container are doing, and they want to water them. They talk about trees as we walk around the campus, wondering why some have no leaves, or commenting about the color and shape of the leaves. 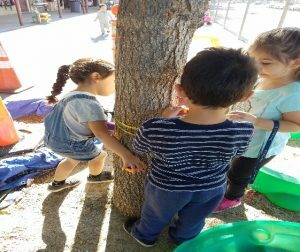 What did your students have the most fun doing?They enjoyed measuring trees with the measuring tape, or more accurately, seeing how many times the tape measure went around each tree. 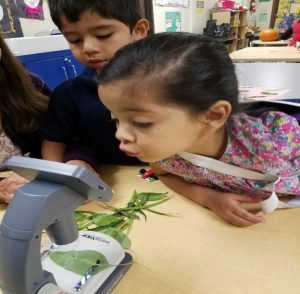 They loved looking at tree parts under the microscope. They also loved the root view planting kit. It came with soil pellets so they had to add water and mix them up to “create” the soil. They also enjoyed watering the plants in the root viewer, especially with eye droppers. 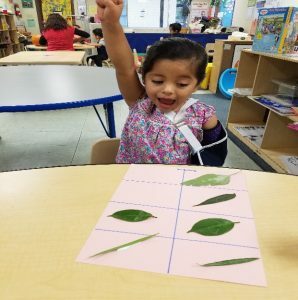 I was also surprised what a hit the leaf matching activity was. 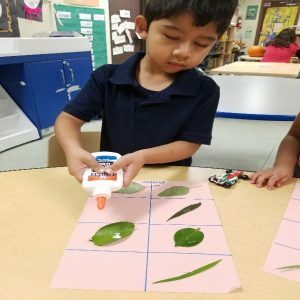 They enjoyed sorting through the box to find the matching leaves, and gluing them onto their paper. What were some challenges you faced in implementing these lesson plans? Do you have any best practices or techniques you used to overcome these challenges? Challenges arose out of the fact that half of my students are very young (just turned 3) and many of them have autism. Most are speech delayed. Some are new to school; others have been with me for 1.5 years already. In order to provide differentiated instruction, I follow the principles of Universal Design for Learning (UDL), and provide multiple means of representation, engagement, and expression. Learners differ in how they understand and learn things, and in how they are able to express what they know. 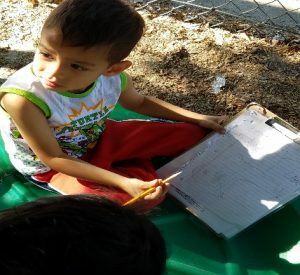 I therefore seek to provide them with information in a variety of ways: with my voice, visuals, hands-on, experiential activities, song, dance, or whatever engages them. I also understand that some may demonstrate what they have learned with words while others will create a piece of art, or build something with Legos, or act it out using puppets. I will repeat instructions as needed, and include visual step-by-step instructions for those who need that. I also modify lessons as needed based on each child’s abilities or challenges. For example, some students could rummage through a box of leaves and find the matching one. A few needed to be shown just two different leaves to start. The whole box would have been overwhelming for them to start with. What advice do you have for fellow educators wanting to implement a similar lesson plan? Any recommendations for facilitation techniques?I have very young students (age 3-4), so these suggestions may fit those with young students more. The microscope we got has a large viewing screen. It can also be attached via USB and the image can be projected. This is much better than trying to get young students to look through an eye piece as one does when using a standard microscope. It also allows for group work as several students can see the image at once. Calling them scientists and giving them scientist “tools” such as safety goggles and eye droppers makes each activity feel more important. 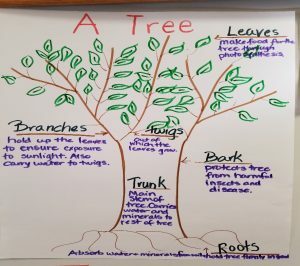 If you are somewhere with bad weather, bring the tree materials into the classroom for the students to observe and use in projects, and try planting indoors. It is too early to tell if we will actually harvest radishes, carrots, and onions, but the plants are growing quite well indoors. Wonderful and inspiring. I can’t wait to share these ideas with friends. Thank you for all your hard work.